A Facebook friend sent me a link to a video of an interview that Jesse van Ruller had with Dutch television. For the complete video with the interview in Dutch click here. Of course, my US friends will not be able to understand the interview, so I translated the gist of it in English. The interview starts off with the interviewer remarking that JVR has the image of being a serious and quiet guy. An image, that hardly fits in our world of flashy entertainers with big mouths. Jesse states that he indeed is not someone that likes to be the centre of attention. He does not regret he is not like that. He would not play the way he does if he were a different guy. Then his musical development is addressed. Jesse‘s parent listened to lots of pop music. Though his parents did not actually play themselves, his father's favourite instrument was the guitar. So he picked up the nylon stringed guitar at 7 and started going to music school to get classical lessons. His sitter used to listen to Hendrix, Queen and SRV and that’s how he was introduced to the electric guitar. Especially the long guitar solos he liked a lot. When he was about 14 he switched to electric guitar and started playing in the music school pop band. Later, in the high school canteen, he heard John Scofield for the first time (he mentions the album “Still Warm”) and was captured by the weird and sometimes even ugly sounds but he dug Sco’s music a lot because it was one big guitar solo. Still, he had no idea it was jazz. The intricacy of the lines fascinated him and he tried to play some of it at home. He was used to hearing only 5 notes out of 12 in guitar solos but here was a guy that used all of them! Such a mystery .... But his classical teacher could not help him out so he switched from his classical teacher to one that taught him the basics of jazz harmony. After high school he went to study jazz at the Hilversum Conservatory. He was more into flashy fusion at the time and had hardly listened to traditional jazz, the music that preceeded it. He did not know his future guitar teacher Wim Overgaauw either. He went to a cafe where Wim was playing to check him out but he did not get it. He simply did not know what bebop was all about and had never heard of Wes Montgomery, Kenny Burrell and the likes. He did not even like the classic archtop sound coming out of Wim's guitar, he admits. And what Wim was playing did not rock his boat either. But ... at the conservatory, all this soon changed and he went back in time and he discovered all the jazz greats. His taste developed back in time, so he tells us. He started to realize where jazz actually came from and he really started to appreciate classic jazz. Wim proved to be a good teacher for Jesse. Because Wim was self taught, the emphasis in his lessons was on discovery. The mystery remained intact. Though Wim certainly knew his theory (as a teacher he had to), the focus was not on books or exercises, but on playing together. The first standard they played was “All the Things You Are,” Jesse remembers. It went quite well. Jesse had been obsessive about practising since he was about 13. This went on while he was studying with Wim at the Hilversum conservatory. He went back in time to bebop and then forward again to Miles. He perceives his development as an eternal quest. These days he is not so concerned with playing the right notes over the changes anymore but more with sculpting sounds, creating tension and holding the attention of his audience. 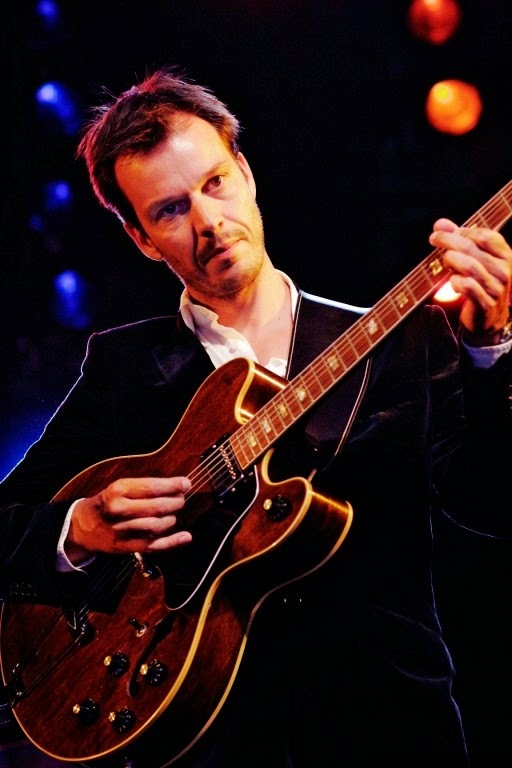 In 1995 he won the Thelonious Monk Jazz Guitar competition. He sent in a tape and to his surprise he was invited to the US to compete. He remembers he was relatively relaxed when he was playing for John Scofield, Jim Hall, Pat Metheny amd Pat Martino (the jury members) because he felt he had little to prove and nothing to lose. They had to play standards and he played “You’re my everything.” Apparently it went well because he won! Maybe the others made some mistakes :) After winning the Monk prize he got some US offers but he preferred to return to the Netherlands. Jesse emphasises the need for phrasing and telling a story and building a solo that communicates. But he is not one to be showy, he adds. He really digs the drummerless trio he is currently in. The sounds of the instruments blend perfectly and it does not matter much if they play a country, pop or jazz tune because they create their own sound instantly. As a student, Jesse used to listen to the jazz greats. To conclude, the interviewer asks Jesse how it feels that a whole generation of guitarists is listening to him now. Jesse tells him he is just passing on his stuff to a new generation. A bit like being a father, which he actually is now. The sound of the album is acceptable at best, but we should be grateful in the first place that a tape recorder captured these musicians in their prime over 40 years ago. Vintage Pat Martino tearing it up in an obscure jazz club in the late 60s. It just does not get any better! And here's two more tracks to enjoy. Click here to get the album. 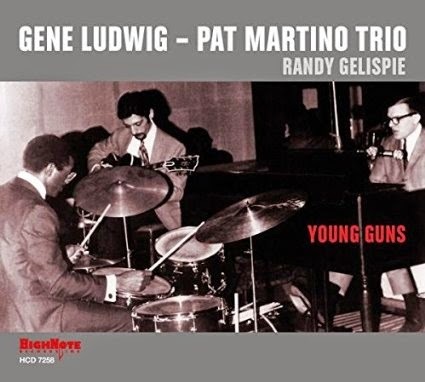 Labels: Gene Ludwig Pat Martino Trio "Young Guns"